In case if you are using ADF Essential(free version of Oracle ADF) for building applications, or if you want to make you application portable across multiple application servers(certified as well as non certified), you may need to compromise on using certain non portable pieces from the ADF stack(security, MDS etc). In such cases, for security related things you may end up in using JAAS or some custom Java security frameworks. In this post I'm sharing some tips on using a really cool Java security framework known as Apache Shiro. The thing that I personally liked is its usability aspects- its very flexible and easy to use. Let us see how Shiro can be used for securing an ADF application. I would not have tried Apache Shiro unless I had seen the following blog post while googling for Java security frameworks http://balusc.blogspot.sg/2013/01/apache-shiro-is-it-ready-for-java-ee-6.html. A well written article. So the credit goes to Bauke Scholtz(BalusC) who wrote that great stuff. Note that, the following section is not going to detail the configuration aspects of Shiro. So please go through the above article from BalusC to get a clear understanding on the usage part. Step 2: As we are using Apache Shiro, let us go and grab the required Shiro jars before starting building the application. You can download the binaries from this link http://shiro.apache.org/download.html#Download-1.2.1.BinaryDistribution. If you are very keen, then go ahead and check out the source from SVN source repository given in the same page. The following files are required for running this sample. You can also find these jars in the example zip file that I uploaded towards the end of this post(see Download section). Find them in <ADFEssentialDemo>/shirojars folder. Step 3: Now let us build the application. 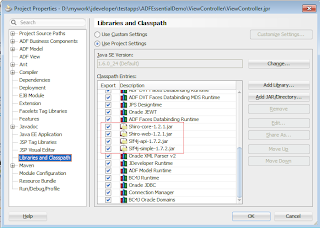 I'm not going to detail the steps for building an ADF Fusion Web application here, rather I just want to highlight few odd steps that you may not be usually doing. As this application use MySQL database, while initializing the Model project select SQL 92 as SQL Platform and Java as Data Type Map. 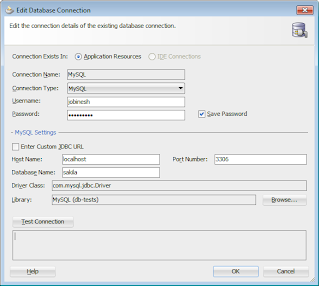 Now create a connection to MySQL. This example uses sample sakila database that comes with MySQL by default. Step 4: Generate business components by choosing appropriate tables. Step 5: Next is to add the required jars to the View Controller project for using Shiro APIs. See Step 2 to know more about the jars. Step 6: Now go to the web.xml file and add the following filter entry. Step 7: Create a a text file and name it as shiro.ini file in your WEB-INF folder. This is text-based configuration file for use by Shiro. We will add entries in this file later. Update the web.xml file with the location of this file as shown below. You can optionally remove JpsFilter related entries from web the filter section as we are not going to use it any more. Step 8: Now lets us talk about security things. The Apache Shiro let you to configure users, roles and permission in shiro.ini file as well in other data stores such as database and ldap. 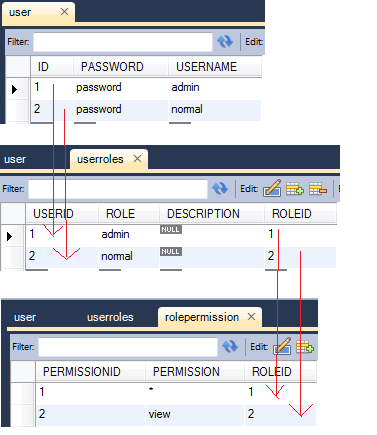 This example uses database for storing application users, roles for users and permissions for roles. It also uses a JDBC realm(org.apache.shiro.realm.jdbc.JdbcRealm) that comes with framework by default. A user can have many roles and each role can have many permissions. So while entering data you must maintain this relation between these tables. Note that as this is just a demo, you may not be seeing any foreign key settings between tables here. I'm bit lazy. You can have it in your real life app. The following screen shot displays data that I used for testing. Step 9: Build the JSF pages as per your business need. 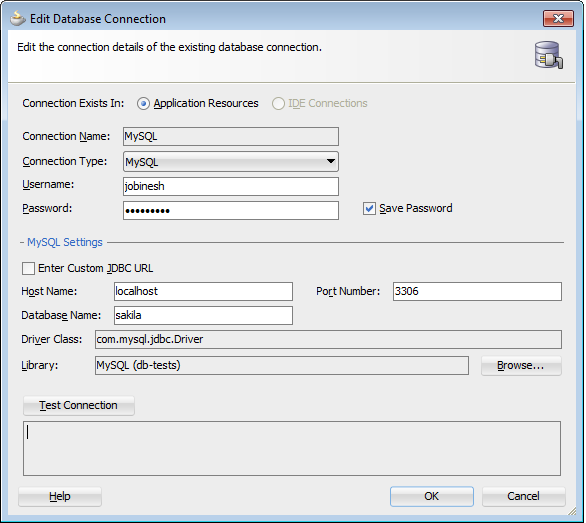 # Configure JDBC realm SQL queries. jdbcRealm.authenticationQuery = SELECT password FROM sakila.User WHERE username = ? How to run the sample? Create tables for storing users, roles and permissions. Then insert required data as appropriate. Details are given in Step 8. Create data source in Glassfish and deploy the application. See Step 11 for details. Try accessing index.jsf, system will redirect you to login page. Enter admin/password and hit Login. System takes you to the index.jsf page. See displays the details. Click Logout, system takes you to login page. Enter normal/password,and hit Login. The normal user is not allowed to view address details. So the system hides address task flow in this case. Disclaimer: I've not tested the above stuff for all security scenarios :) If you are planning to use it, run one round of complete test and make sure Shiro meets(and works) all your security use cases. Enjoy ! Just a warning: we found out that Shiro puts a wrapper round the HttpSession-object and when we wanted it distributed via Coherence - Distribute, ADF BC was very unstable, even when there was only one WebLogic-server active. After disabling Shiro and instead used Coherence*Web the problem was solved. I think the problem is due to that ADF BC wants to distribute the Application Module and needs the HttpSession-object to reconnect on other servers. Hi Sir, can you please tell me how to change default 'Loading..' animation in adf? 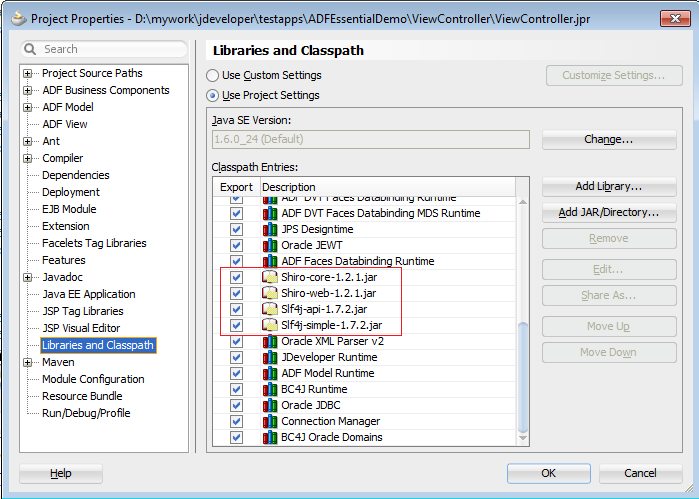 Previously ADF apps Deployed with JDK11.2.3, shiro, Mysql in Glassfish. Now JDK updated with 12c and try to deploy it is giving error. Error is : Error occurred during deployment: Exception while loading the app : java.lang.IllegalStateException: ContainerBase.addChild: start: org.apache.catalina.LifecycleException: java.lang.IllegalArgumentException: java.lang.ClassNotFoundException: org.apache.shiro.web.env.EnvironmentLoaderListener. Please see server.log for more details. It is an informative post.